Since 2015, Surrey has seen a 50% rise in homelessness. Surviving the day – and night – can be an overwhelming challenge for men and women who are homeless or at risk of homelessness. 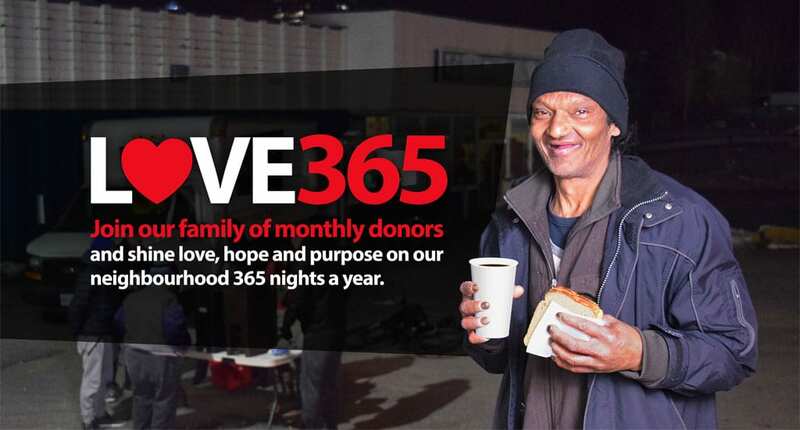 Love365, NightShift’s family of monthly donors, are a group of caring neighbours who know that offering comfort through Christ-centred community, and creating opportunities for connection and support, can help restore dignity and encourage someone in need. You can care for your neighbours in need today. 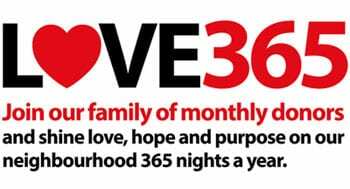 By giving to NightShift every month as a member of Love365, you can provide vulnerable men and women with a hug, a warm meal, clothing, and access to trauma counselling, every night of the year. As a member of Love365, you support people like George. George is one of NightShift’s regulars. Most nights we see George at our outreach meal, helping volunteers, joining new faces for dinner and carrying on conversations with the friends he’s made over the years at NightShift. George was born and raised in Fiji. He came to Canada when he was 16 and completed high school here. After graduation he joined CP Rail as a railway car mechanic. George’s favourite part of the nightly meal at NightShift is the Prayer Circle. During the meal, a group of faithful volunteers will spend time chatting with our guests and asking for prayer requests. Then afterwards, the volunteers and anyone wishing to join them, form a circle and lift up the needs of our community in prayer to God. George has been clean and sober for 8 years, and now lives with his sister, while he hopes for a place of his own. He attends our nightly meal because he wants to help others who are where he once was. “The only way to connect with them is by joining them in the meal,” George explains. This Easter we are planning a special celebration meal with our community. You are invited to join us by considering a monthly gift in support of our ministry. $30 a month provides vulnerable men and women with a hug, a hot meal, clothing, and access to basic medical care and crisis counselling this Easter and the remaining 365 nights a year our outreach – and hearts – are open.